It’s the morning of day two in the Erindi Game Reserve in Namibia and the students wake to the rasping call of a large male leopard around 30 meters from the bush camp. What a nice wakeup call! 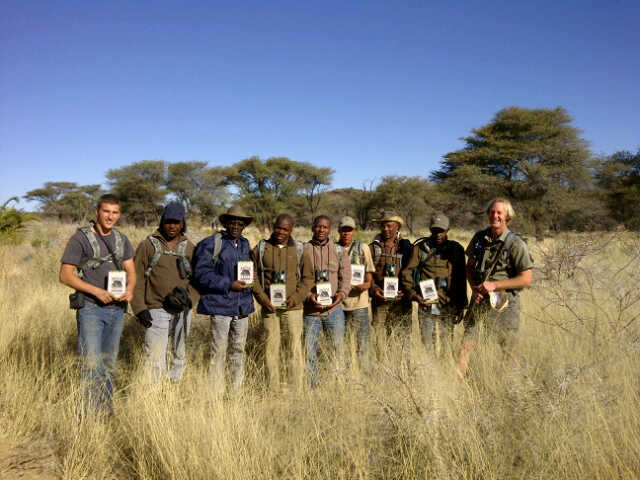 Kanabo have partnered with EcoTraining to deliver this unique FGASA Level One (28 day) field guide training. The Distel brand, and in particular the Amarula Trust, have funded the training as part of their on-going commitment to corporate social responsibility. Students received a new camel backpack, binoculars and a book bag which included maps and a general wildlife book to support their bush learning experience. Erindi boasts an impressive list of flora and fauna; it’s easier to name what they don’t have than what they do. There are indeed exciting times ahead for this group, keep coming back for more updates!